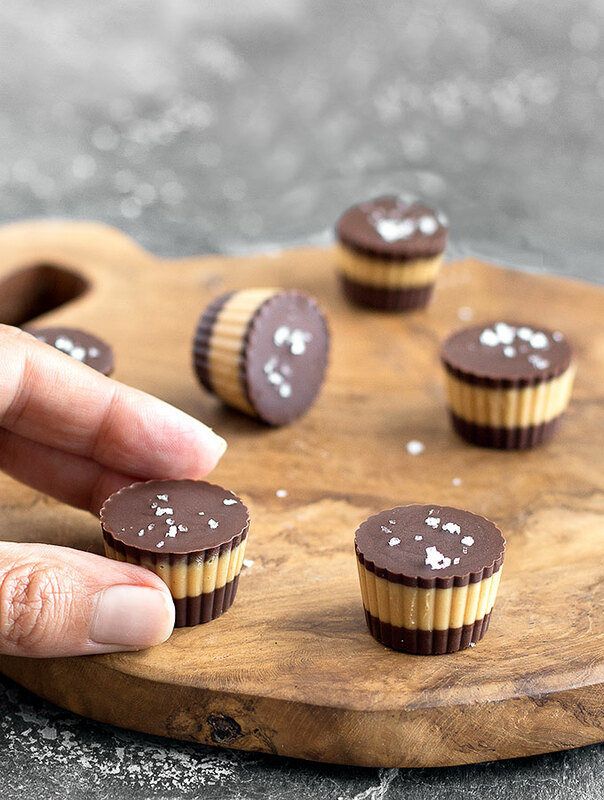 To make salted chocolate peanut butter cups all you need is a handful of ingredients (most of which you probably already have in your pantry), a chocolate mould or a mini muffin tin + paper liners, a microwave, and a freezer. Just start with a layer of melted dark chocolate, freeze, then a layer of peanut butter, freeze again , and more chocolate on top. Sprinkle with coarse sea salt, then place the tray in the freezer for 15 minutes or so and wait for them to firm up. It’s as easy as that! 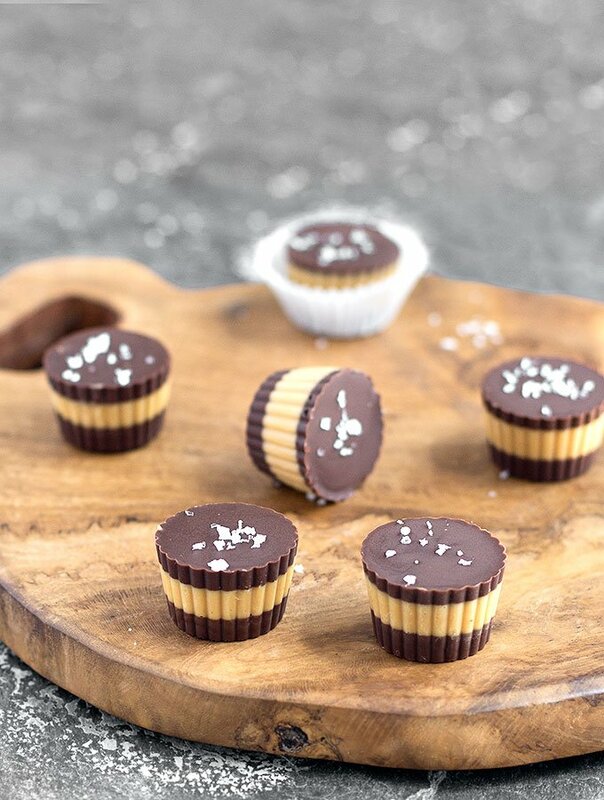 You can customize your peanut butter cups in a number of ways. 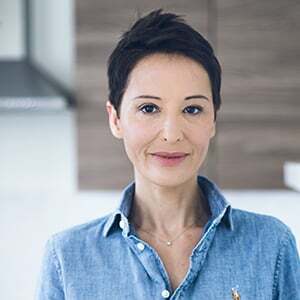 I always make them with dark chocolate because I ♡ dark chocolate, but feel free to use whatever you have on hand or prefer. You could also substitute the peanut butter with almond butter or any other nut or seed butter. Store the cups in the fridge or freezer for up to 5 days. I don’t advise you to keep them at room temperature because they will melt. 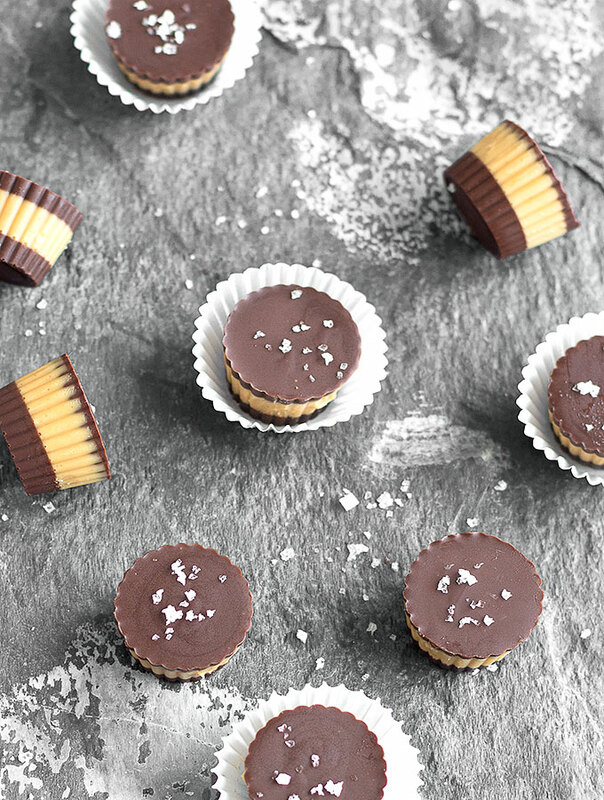 Salted chocolate peanut butter cups are one of those desserts I can’t resist and I think you guys are going to LOVE them. Just be warned that these are very very hard to resist! 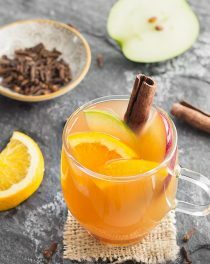 If you give this recipe a try, let me know what you think! Leave a comment, rate it, and don’t forget to take a picture and share it on my Facebook page or tag it #aseasyasapplepie on Instagram! I love seeing what you come up with! Line a mini muffin tin with papers liners. Alternatively, you can also use a chocolate mold, which is what I used. Melt half of the chocolate in the microwave in short increments, stirring after 30 seconds, for about 1 1/2 minute. Add 1 teaspoon of melted coconut oil and mix until smooth. With a small spoon, evenly distribute the melted chocolate into each muffin cup. Freeze for 15 minutes. 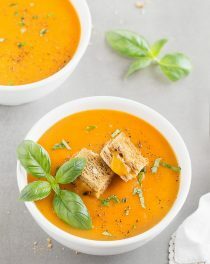 Place the peanut butter and 2 tablespoons of coconut oil in a small bowl and microwave for 30 seconds. Stir well. Portion small spoonfuls of peanut butter on top of the chocolate layers. Freeze for 15 minutes. Melt the remaining chocolate. Add 1 teaspoon of melted coconut oil and mix until smooth. Spoon the chocolate mixture over each peanut butter cup. Place the pan in the freezer for 3 minutes, take it out and sprinkle with coarse sea salt. Return the pan to the freezer for 15-20 minutes or until firm. 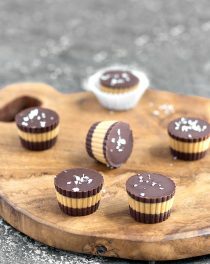 Store the salted chocolate peanut butter cups in an airtight container in the fridge or freezer for up to 5 days. 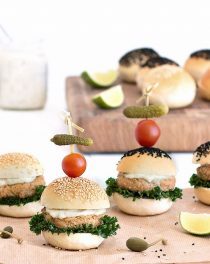 The pictures are gorgeous and I can’t believe how easy these are, thanks! This looks oh-so easy. Plus now I have a reason to buy that chocolate mold I’ve been eyeing!